This is the introduction to Atlas of East and Coastal Georgia Watercourses and Militia Districts. Buy your copy today. Most of the east and coastal region of Georgia was distributed under the headright land system. Men were allowed grants to prescribed amounts of land based on the number of heads in their household, or for military service. Each grantee chose the location of their land, resulting in the haphazard arrangement of surveys. The map (opposite) shows the boundaries of the headright area. Shaded areas were distributed by land lottery beginning in 1805. Land descriptions in Georgia’s headright area refer to watercourses and adjoining land owners to identify boundaries. Tax, census, and other government records are arranged by militia district. Many tax digests also include references to watercourses. Because of their use in legal documents, watercourses and militia districts are the two most important features for locating land and the places people lived in the headright area of Georgia. This book is meant to provide a map reference to those features. Each county is presented on a single page, giving researchers a quick reference that can easily be copied and used for note taking. The names of major watercourses are the same today as they were during the earliest periods of settlement. Minor creeks and branches often went unnamed for decades, many only becoming named in the 20th Century. Until the 1840s and 1850s, militia districts were generally named after the captain. Each time a new captain was voted into command, the district name changed. Just before the Civil War, this practice went out of favor and militia district names became permanent. Some retained the name of a captain but most took names of features in the area, like rivers or communities. Because militia districts are minor civil divisions their boundaries have changed regularly over time, with new districts being created and old ones abolished. In this way, they are similar to counties. Unfortunately, limited historical details of militia district boundaries have been kept, it only being in the late 19th Century that boundary descriptions began to be maintained by the state. Researchers can assume that districts with higher numbers were cut from nearby districts with lower numbers. Those interested in researching boundary changes over time should first consult Petitions Concerning Militia Districts at the Georgia Archives (RG 3-1-60). A number of published resources compliment these maps. Farris Cadle’s Georgia Land Surveying History and Law describes in detail the history and process of the headright land system. It is a key resource for developing a fundamental understanding of the way land in Georgia has been surveyed and distributed. Kenneth Krakow’s Georgia Place Names is an important reference for locating places and learning the historical origins of place names. The Atlas of Historical County Boundaries allows researchers to display county boundaries on any date and compare them to modern county boundaries. A concise history of militia districts was written by Alex M. Hitz. Geographic data used in this book was produced by the Georgia Department of Transportation from USGS topographic maps and DOT county road maps. Militia district names were obtained from Georgia’s Militia District Names: 1804 to the Present, an unpublished manuscript by Janet Bryan McLendon, available at the Georgia Archives. Acker, Martha Walters. Deeds of Franklin County, Georgia, 1784–1826. Easley, S.C.: Southern Historical Press, 1976. Acker, Martha Walters. Index to Deeds of Franklin County, Georgia, 1785–1860. Birmingham, Ala.: Acker, 1979. An Index to Georgia Colonial Conveyances and Confiscated Lands Records, 1750–1804. Atlanta: R. J. Taylor, Jr., Foundation, 1981. Beckemeyer, Frances Howell. Abstracts of Georgia Colonial Conveyance Book, C-1, 1750–1761. Atlanta: R. J. Taylor, Jr., Foundation, 1975. Bryant, Pat. Entry of Claims for Georgia Landholders, 1733–1755. Atlanta: State Printing Office, 1975. Crumpton, Daniel Nathan. Burke County, Georgia, Land Records: Boundaries as of 1777. Warrenton, Ga.: D. N. Crumpton, 2009. Crumpton, Daniel Nathan. Jefferson County, Georgia, and Some Surrounding Areas: Land Records, 2 vols. Warrenton, Ga.: D. N. Crumpton, 2003. Crumpton, Daniel Nathan. Richmond County, Georgia, Land Records. Warrenton, Ga.: D. N. Crumpton, 2007. Crumpton, Daniel Nathan. 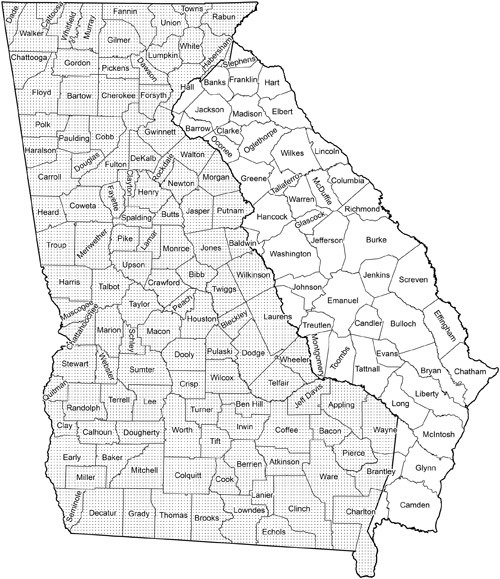 Warren County, Georgia, Land Records. Warrenton, Ga.: D. N. Crumpton, 2002. Davis, Ann Richardson. McIntosh County, Georgia, Deed Book A: Notes for Genealogy and Research. Darien, Ga.: Sea Griffin Pub., 2003. English Crown Grants in Georgia, 1755–1775. Atlanta, Ga.: Surveyor General Dept., 1972–1974. Farmer, Michal Martin. Elbert County, Georgia, Deed Book A–J, 1791–1806. Dallas, Tex. : Farmer Genealogy Co., 1997. Farmer, Michal Martin. Oglethorpe County, Georgia, Deed Book A–E, 1794–1809. Dallas, Tex. : M. M. Farmer, 1999. Farmer, Michal Martin. Oglethorpe County, Georgia, Deed Book F–J, 1809–1820. Dallas, Tex. : M. M. Farmer, 2000. Kelly, Lawrence B., Mrs. Bulloch County, Georgia, Records: Deed Book AAAA and Record Book 5, 1819–1840. 1985. Lucas, Silas Emmett, Jr. Index to the Headright and Bounty Grants of Georgia, 1756 – 1909. Revised edition. Greenville, S.C.: Southern Historical Press, 1992. Marsh, Helen Crawford. Land Deed Genealogy of Hancock County, Georgia. Greenville, S.C.: Southern Historical Press, 1997. Mathews, Nathan, and Kaydee Mathews. Abstracts of Georgia Land Plat Books A & B, 1779–1785. Roswell, Ga.: Wolfe Pub., 1995. Poss, Faye Stone. Jackson County, Georgia, Deed Abstracts, Books A–D, 1796–1808. Fernandina, Fla.: Wolfe Publishing, 1998. Poss, Faye Stone. Jackson County, Georgia, Deed Abstracts, Books E–G, 1808–1822. Snellville, Ga.: F. S. Poss, 2000. Thomas, Allen. Laurens County, Georgia, Legal Records, 1807–1832. Roswell, Ga.: W. H. Wolfe Associates, 1991. Turner, Freda R. Greene County, Georgia, Land Records, Deeds, 1785–1810. Fernandina Beach, Fla.: Wolfe Publishing, 1997. Warren, Mary Bondurant. Georgia Governor and Council Journals. Danielsville, Ga.: Heritage Papers, 1991. Weeks, Eve B., and Robert S. Lowery. Mary Bondurant Warren, ed. Georgia Land Owners’ Memorials, 1758–1776. Danielsville, Ga.: Heritage Papers, 1988.